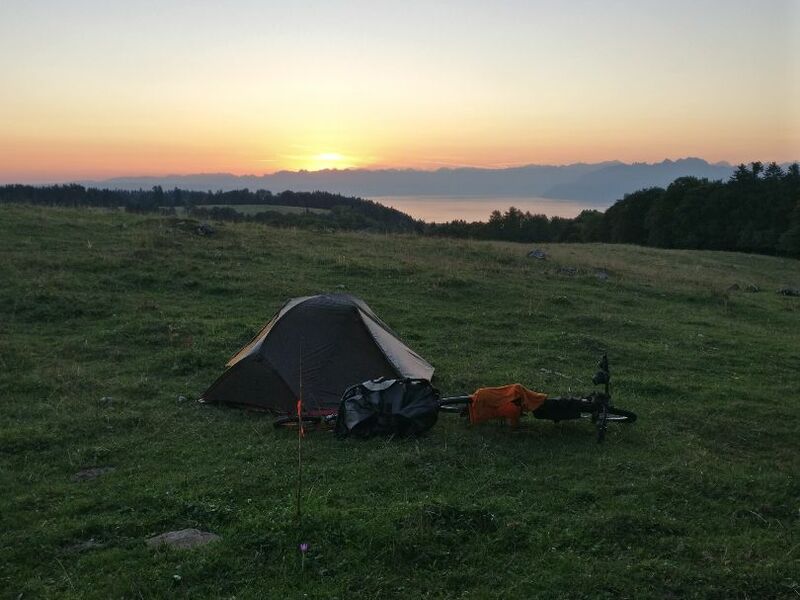 Let’s catch up with Bertrand, his bike and his STD 100 trailer on a ferry between Puerto Yungay and Puerto Rio Bravo in Chile. The weather was quite good up till now, unfortunately the rain is joining the trip while on the ferry. Forced to take a break for lunch in a small shelter along the road, Bertrand meets a farmer who invites him to share his lunch close to the fire. This farmer is the owner of about 50 cows. He has no car, he rides his horse when he needs to get somewhere. He makes a living out of the meat he sells and by making ‘sogas’ : ropes used for bovine tools and horses. Here, all houses look the same. That night, Bertrand finds a shelter on the road with a chimney. Lots of wild animals cross the road of Bertrand and his bike, birds : ducks, cormorants, lots of hares and ‘huemuls’ : deers of the south of the Andes. 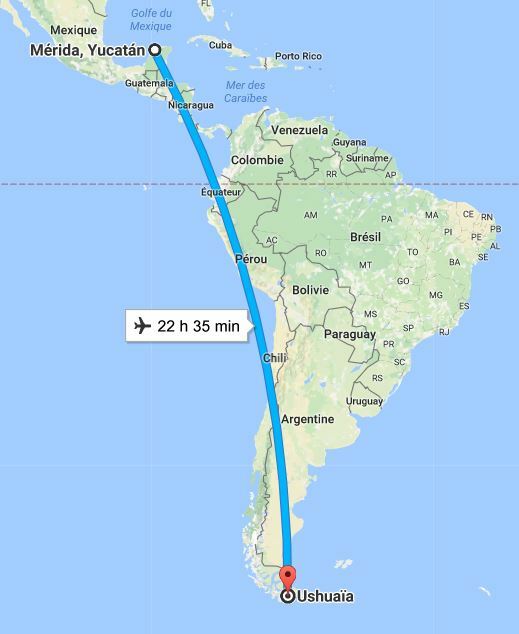 Finally, he gets to O’Higgins, which means the end of the Carretera Austral and the proximity with the Argentina border. 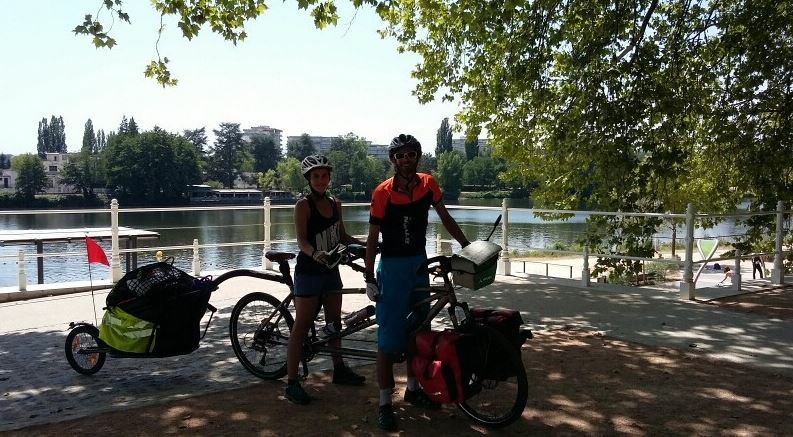 There are only 60km to cycle and two ferries to take. On the road before the ferry, Bertrand meets Pacha, a local dog that will follow him for a few miles. Between the two ferries, things become complicated as there is no road anymore. 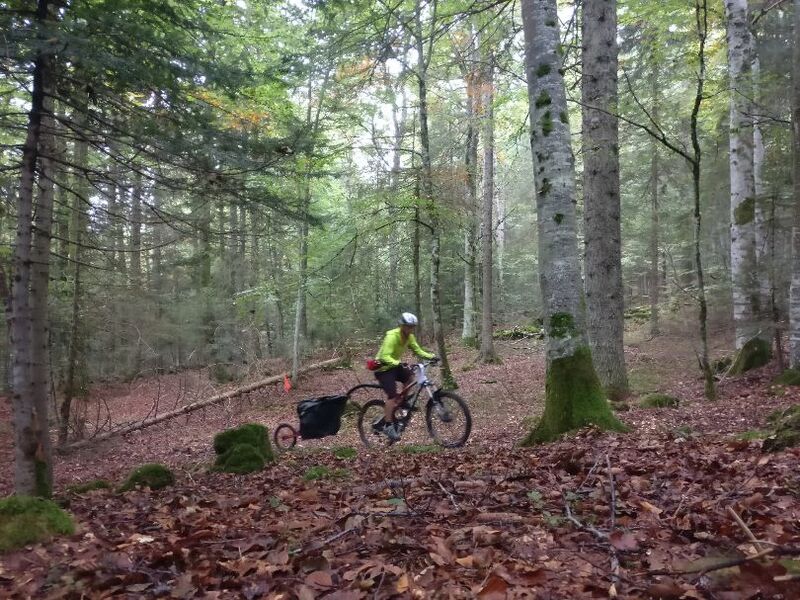 Bertrand has to disassemble his Aevon trailer STD 100 and his bags to go over some obstacles. After a good night’s sleep, Bertrand finally reaches El Chalten. 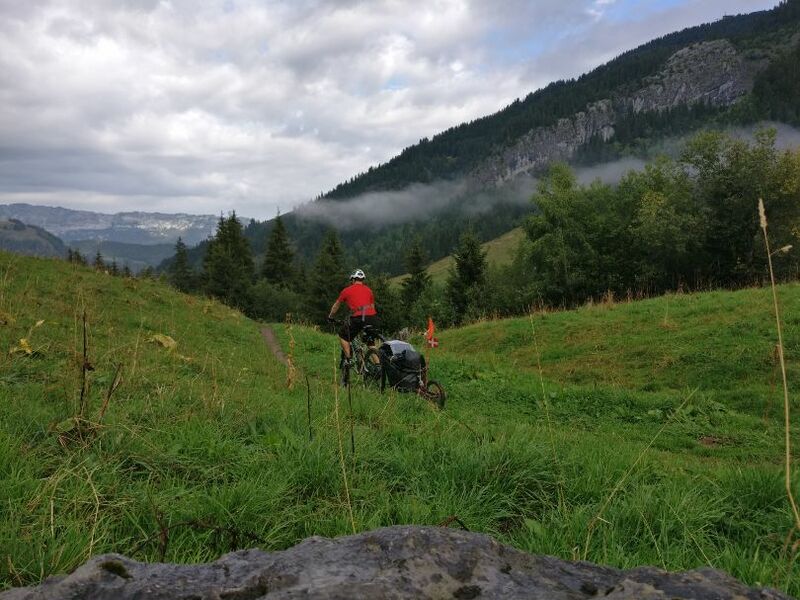 Hans has decided to test the Aevon trailer UNO 100 after seeing it at the Eurobike show 2018. 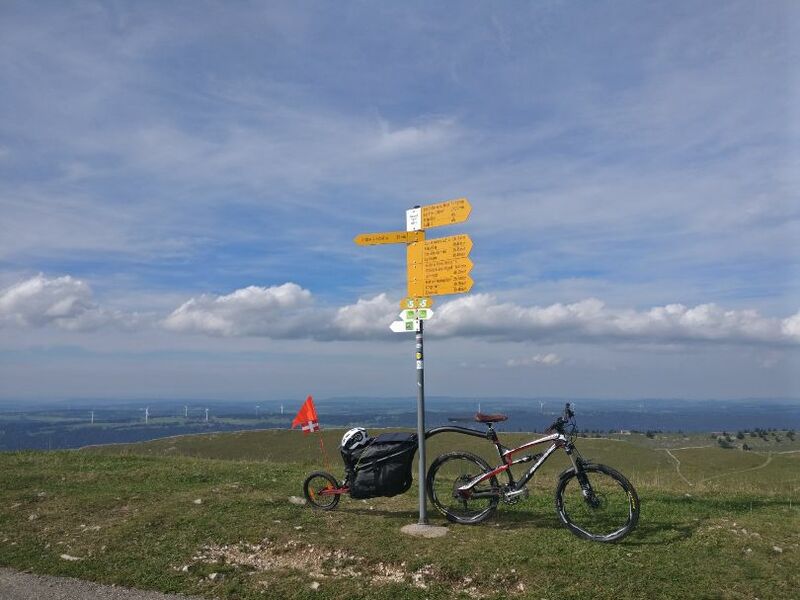 “At this year’s Eurobike, I came across Aevon‘s booth. 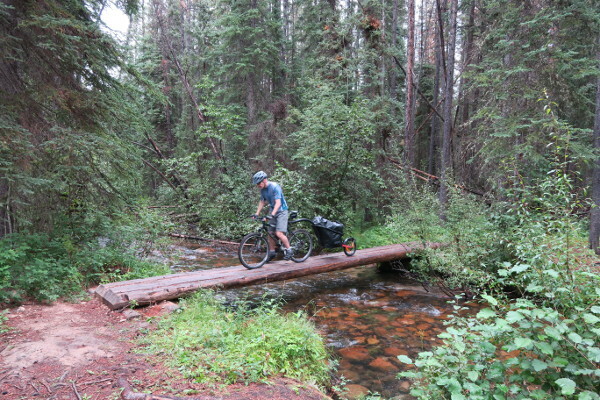 Their bike trailers are made for single-tracks, contrary to the trailers I have known so far. I decided to test the UNO 100, the lowest-priced model from Aevon. It is made of steel and intended for a use on roads. 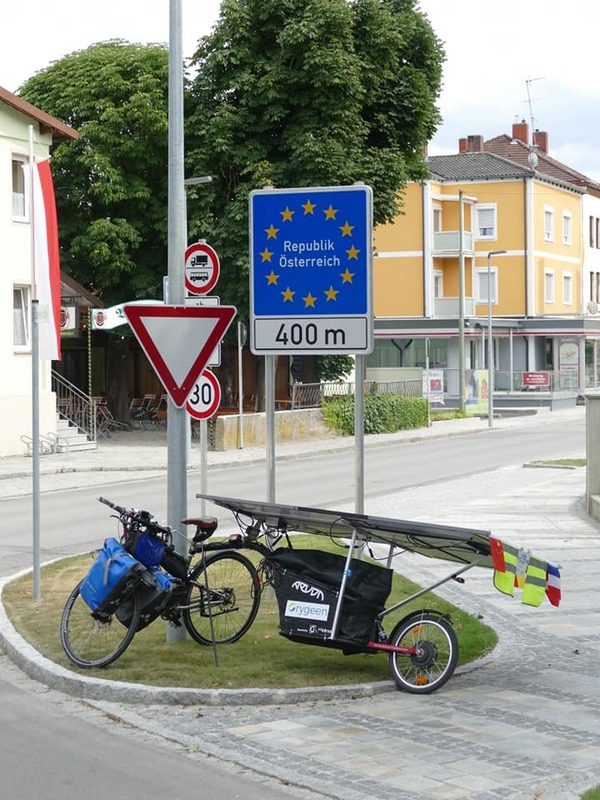 When you unpack the trailer you need to set up the beam (connecting the trailer to the bike) and the rear wheel with its mudguard, it’s done in a few minutes. I recommend that you add the quick release for the hitch, it makes it easier to connect and disconnect the trailer without using tools. If you’re going on holiday, it seems a really good device. I first went for a ride of about 15km around my place : the Rhine-Hesse, in Germany. 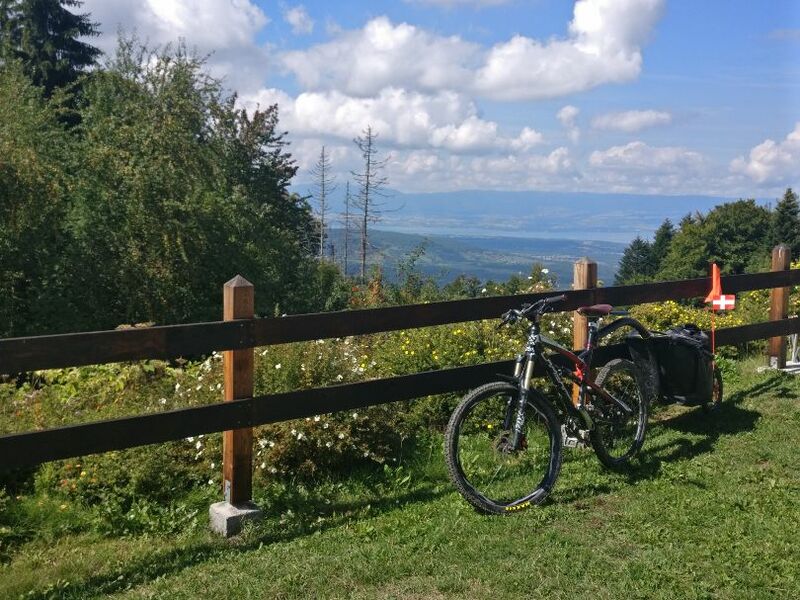 I immediately cycled uphill for 4km with a 7% gradient and went again downhill and was pleasantly surprised. You don’t really feel the trailer behind you. I then tested the UNO 100 trailer for an everyday use, loaded it for my shopping, parked near my supermarket, went for regular rides. I checked the usual bike paths in my area. The real challenge is the usual for anyone who cycles regularly : sharing the road with other users (cars and others bikes). That’s already an issue when you’re not equipped with a trailer but you need to keep in mind that your gear is much longer than usual, especially when you’re turning. In the end, I can say it went rather smoothly considering the load your trailer enables to carry. 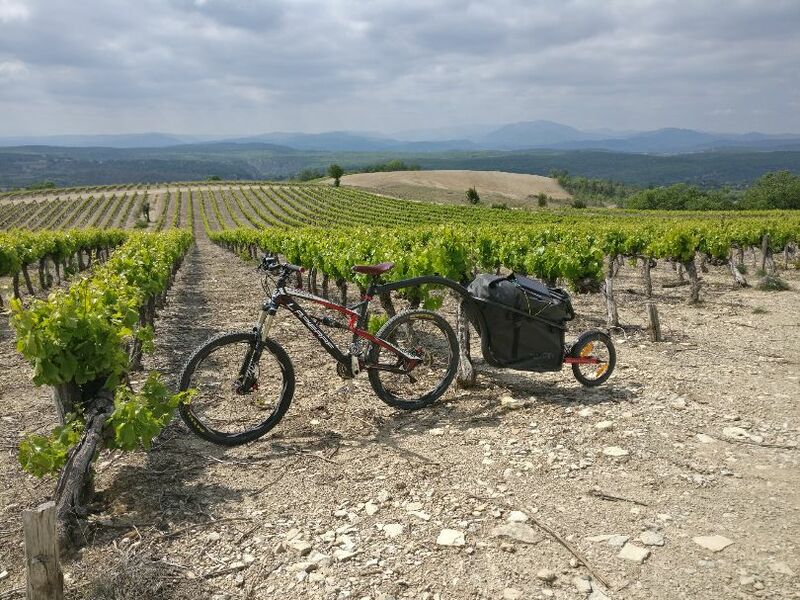 Aevon attracts more and more globetrotters around the world with trailers specifically designed for bike trips. Attached to the seat post and equipped with a single wheel, their handling ability is perfect. The distinctive feature of the KIT L80 is that it’s completely foldable. Ideal for travellers taking the plane. 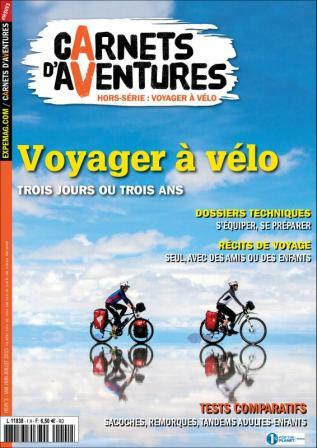 The KIT L80 has been elected best trailer in the world by two magazines :Carnets d’Aventure (France) and Adventure Magazine (USA). The KIT L80 is in aluminium, a strong material to resist the extreme conditions of challenging trips. Its waterproof bag, of 100L, can carry all the gear necessary for 2 travellers who go bivouacking. Its waterproof bag can carry up to 45kg and 145L. The STD 100 also went travelling with many adventurers. We also have more and more customers from the United States, Canada and Australia and we’d like to take this opportunity to say hi to Les from Australia. He adapted his bike trailer to carry his daughter’s bike and go along with her to school every day. Alee, manager of the website Cycling.About tested the KIT L80 during a trip to Japan. 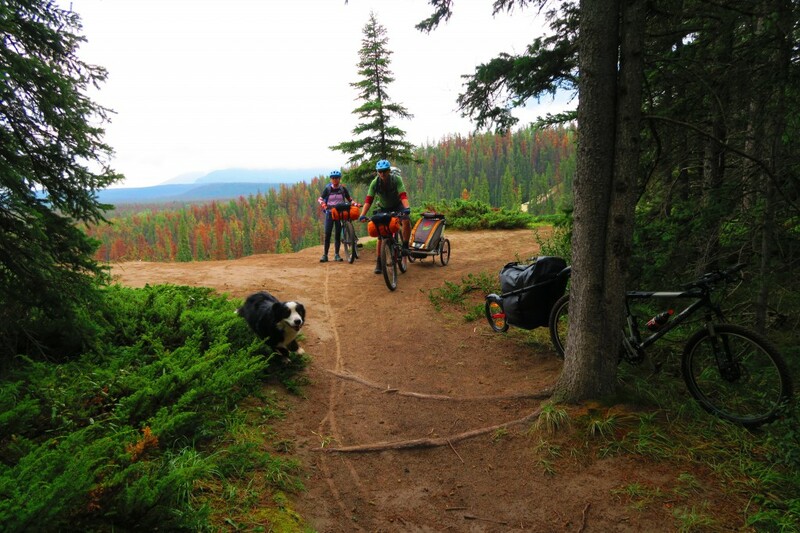 We remember the famous bear attack, that ended with a few scratches on the trailer’s bag. Keep on sending us your experiences, we’ll be happy to share them. 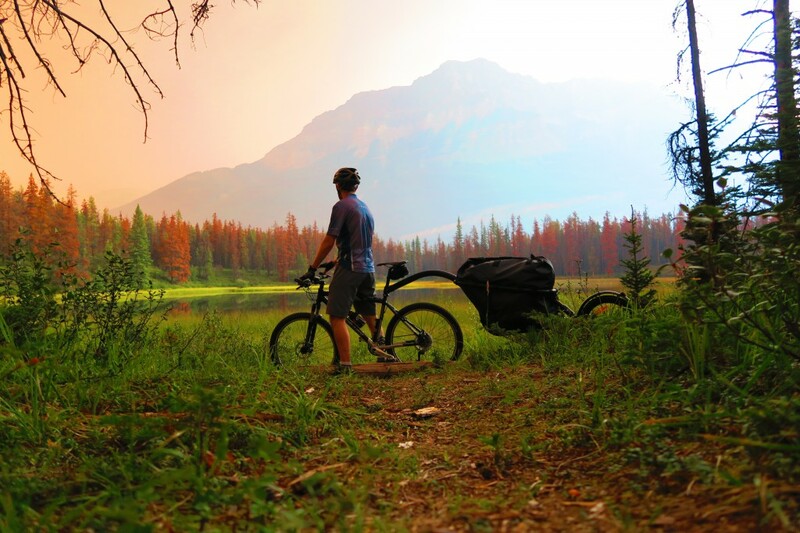 Elroy is using the Kit L80 Aevon trailer, he tells us about his latest trip in Jasper National Park, Canada. In August 2018, I joined some colleagues on a 3-day trip to the Fryatt Valley in Jasper National Park (Alberta, Canada). 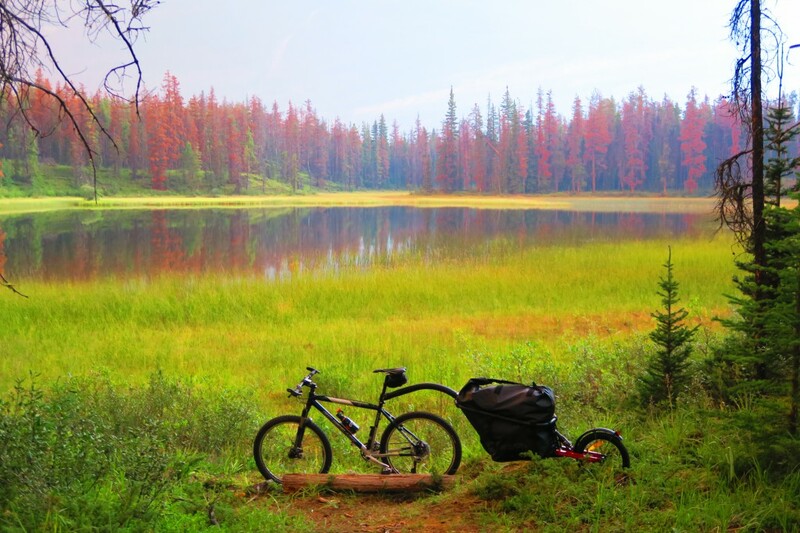 It is not always simple to travel in the backcountry with a young child so we had some discussion about the best way to travel and settled on bikepacking into the valley. They would take their two-wheeled chariot behind one of their bikes but with a child in the chariot it did not leave much room for all their gear. I am not a fan of carrying a big rucksack on my back when cycling. 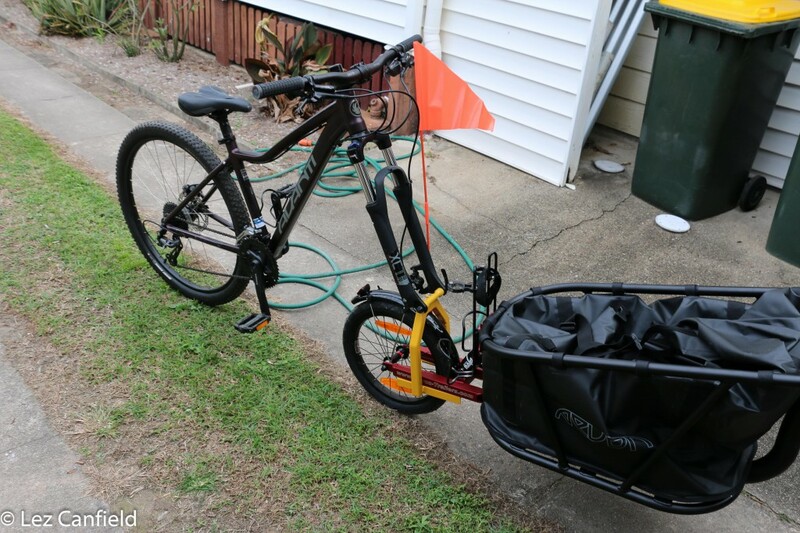 So I looked around for a bike trailer and after much online research, ordered the Aevon Kit L80 trailer. It was easy to fold up and fit into my car for the 4 hour drive to Jasper from my home. I could fit all my gear into the trailer, a fair amount of their gear and food for the dog. 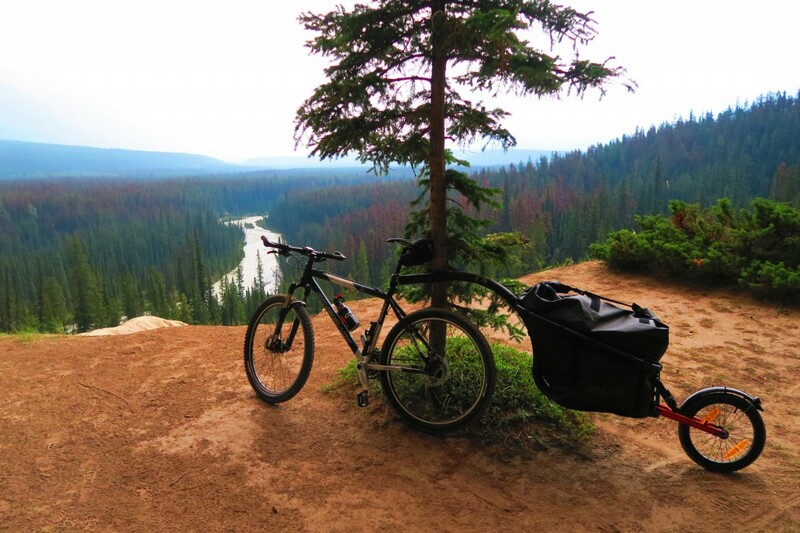 I have read a lot about the debate between panniers vs. trailers for bike touring but for single-track backcountry bikepacking it is a no-brainer that this single wheel, seat post mounted trailer is the way to go. 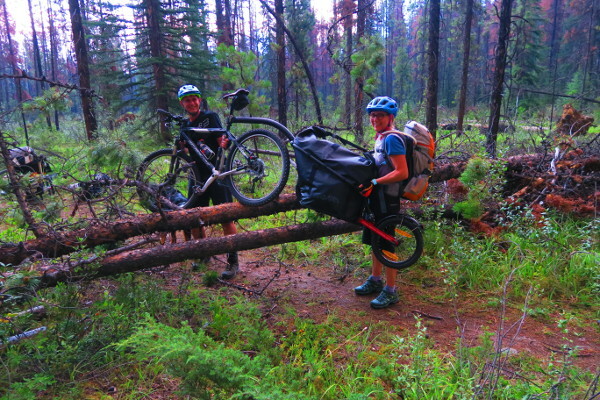 Panniers are just too wide on the trails. Rear wheel hub-mounted trailers have a very big turning circle. We were all very surprised how well this trailer performed. You can mostly forget that it is there and just hit the trail. You do feel the weight on the uphill though! The kit L80 tracks beautifully behind the bike. 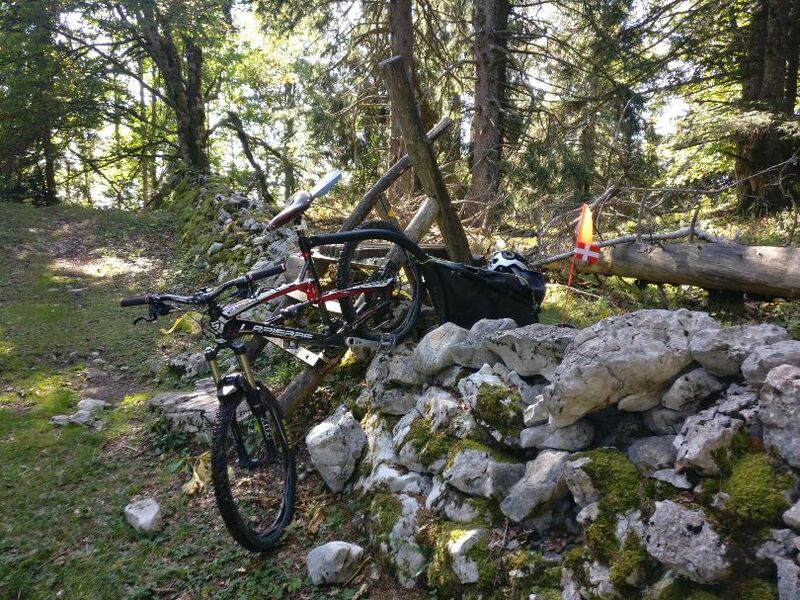 You can choose the best line on rocky trails and the trailer wheel follows the line of the bike. That was not true for the two-wheeled chariot where you have to ride over an obstacle with the bike to avoid hitting it with one of the wheels of the chariot. The chariot overturned a number of times. Fortunately without injury to its occupant! Most of the trail was single track that got very rocky and rooty in places. 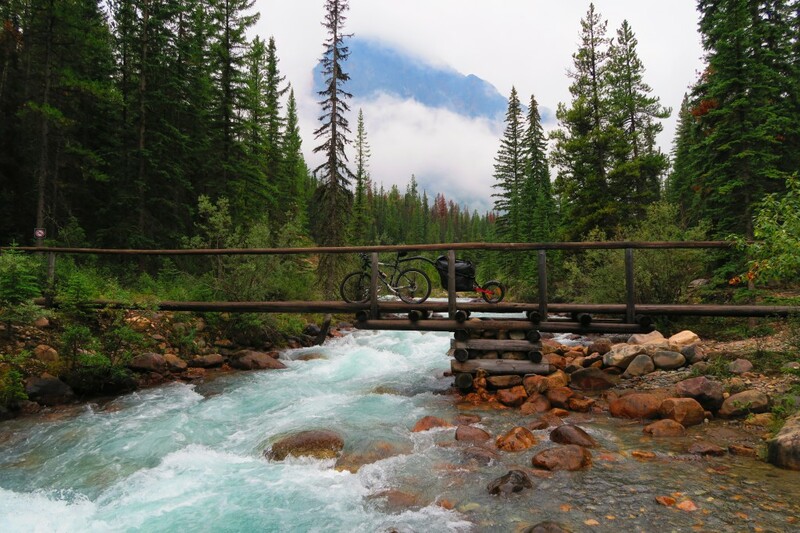 The trail is classified as a blue bike route in Canada. I set the shock on the trailer to its second highest mounting position for ground clearance and never had a ground strike going over obstacles. The shock came pressurized to quite a high value and I reduced it according to the table in the instruction manual to fit the weight of the trailer. I did not really feel the trailer behind me when going over rough ground. Really a smooth ride! I was very impressed as it was loaded way more than it would be if I just had my own gear in it. and was completely waterproof. We had several river crossings and I did not always have someone to lift the trailer up, so I sometimes just went right through with the water above the bottom of the trailer, hoping that my waterproof liner bags would keep my gear dry. Not a drop got into the bag though. On inspection afterwards I noticed the seams all seem to be heat welded and quite waterproof. 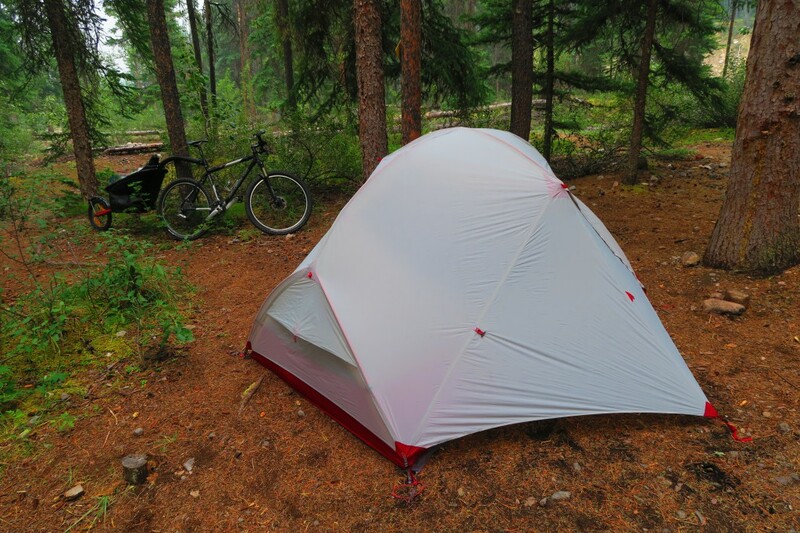 We arrived late at Lower Fryatt and had to cycle the last few kilometres in the dark with headlamps and set up camp in the dark. It rained quite hard during the night. Our food was hung up high in a bear hang to avoid attracting bears, but the trailer just stood out in the rain and again remained totally dry inside. 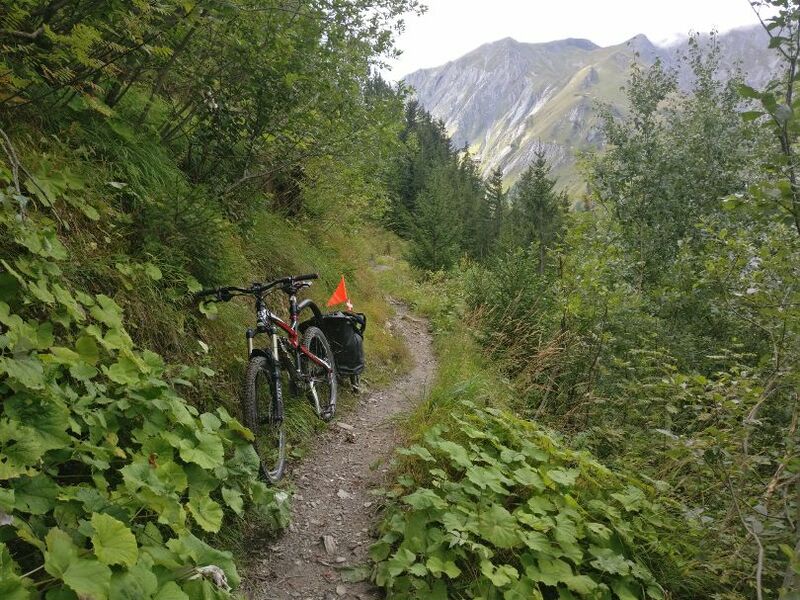 It was a great trail. 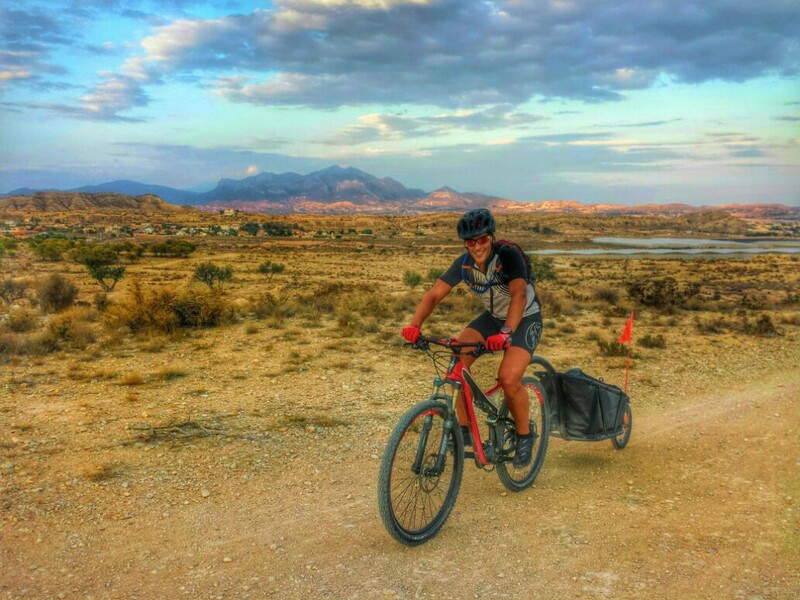 I must say I caught a bit of the bikepacking bug and will definitely use this bike trailer on many more backcountry trails as well as hard surface tours where I can fit in more gear to make the trips more comfortable. It has more space than I think I will ever need with just my own gear. The Sun Trip has started on June 15th for a trip of 12 000km from Lyon to Guangzhou, North East of Hong Kong. 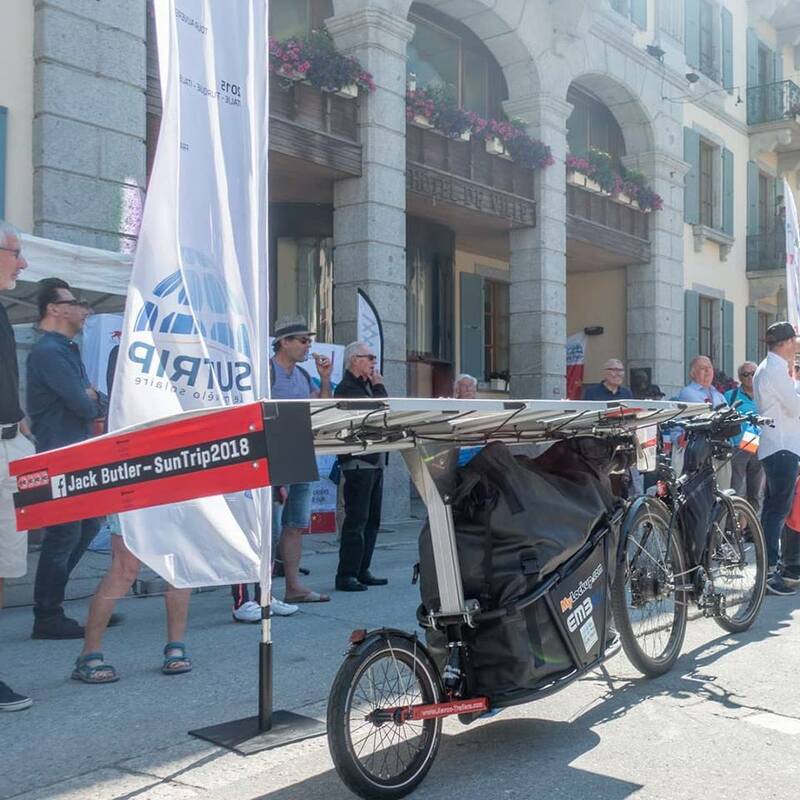 Two participants carry the Aevon flag : Jack Butler and his STD 100 bike trailer and Eymeric Thuliez with his 1000w electric trailer. 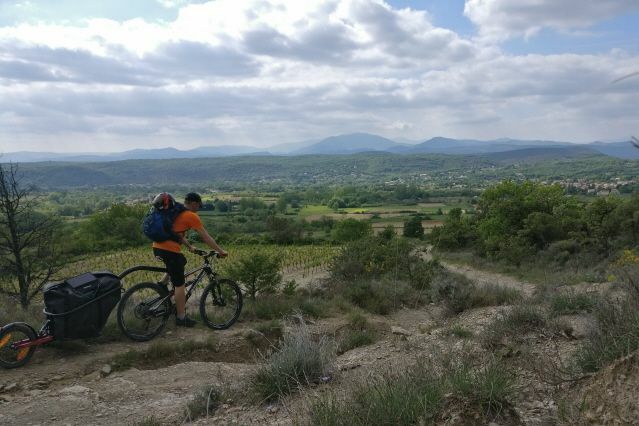 Jack has already cycled for 1810km, Eymeric has chosen a different route and announced yesterday he had reached 1200km. To follow them live, check out the Sun Trip website. Both competitors have had their difficulties and managed to overcome them easily. Jack was forced to stop in Poland because of a problem with his solar pannel. The steel rack had split in two. Luckily a Polish man speaking very good English offered to take him to his workshop where he had all the tools necessary. He helped Jack get on the road again in about 20 minutes, a meeting that probably saved his race. Eymeric had to face very bad weather. After crossing Austria, he has just arrived in the Czech Republic. He cycled along another participant who had to stop the race because of a failure with his vehicle. Now he’s on his own. In these conditions, the material is put under a lot of pressure and Aevon trailers will show their strength and efficiency on all types of roads. The STD 100 is in aluminium, which makes is strong enough to cycle for thousands of kilometers. Thanks to its shock absorber, the competitors can count on the flexibility of their travelling companion.